If the trees on your yard are in dire need of a trim, you can count on AJ Tree Service to safely and competently carry out the job. Tree trimming or tree pruning can definitely improve your back or front yard view. 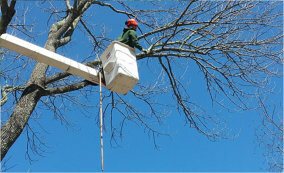 Besides the aesthetic benefits, tree trimming also keeps trees healthy by removing dead branches which is essential when we conduct our services for Tree Removal and Landscaping in Broken Arrow, Oklahoma. AJ Tree Service has been in the business for many years and we know what it takes to properly trim trees to prevent further damage or possible yard accidents. We use specialized tools and time-tested techniques to keep the wood growth on your property under control.